USADA announced today that an independent arbitrator has rendered a decision in the case of UFC® athlete Francisco Rivera, of Bueno Park, Calif., and determined that Rivera should receive a four-year period of ineligibility for his anti-doping policy violations. This decision comes after the facts of the case were presented and fully argued at an evidentiary hearing on December 5, 2017. Rivera, 36, tested positive for clenbuterol as the result of an out-of-competition urine sample he provided on July 23, 2016. Clenbuterol is a non-Specified Substance in the class of an Anabolic Agents and prohibited at all times under the UFC Anti-Doping Policy, which has adopted the World Anti-Doping Agency (WADA) Prohibited List. After a thorough investigation into the circumstances of Rivera’s case, USADA concluded that the clenbuterol levels detected in his sample were inconsistent with what could be expected from meat contamination. Furthermore, Rivera was unable to provide independently verifiable evidence to support his claim that he had traveled to Northern Mexico and ingested meat in the days leading up to the relevant sample collection. Thereafter, Rivera opted to have his case submitted to a neutral arbitrator for resolution. In advance of the arbitration hearing, USADA’s ongoing investigation revealed that several pieces of evidence presented by Rivera to USADA and the arbitrator had been falsified to support the athlete’s claims that the substance had originated from contaminated meat in Mexico. Under the UFC Anti-Doping Policy, deceitful or obstructive conduct intended to avoid the detection or adjudication of an anti-doping policy violation may be regarded as aggravating circumstances, which can lead to an increased period of ineligibility. In this case, the independent arbitrator concluded that Rivera’s conduct warranted an increase from the standard two-year period of ineligibility for a first offense, to the maximum four-year period of ineligibility due to aggravating circumstances. Rivera’s four-year period of ineligibility began on August 17, 2016, the date on which he was provisionally suspended from competition. This decision, which was rendered by an arbitrator from McLaren Global Sport Solutions, Inc. (MGSS), can be found here, along with all other UFC Anti-Doping Policy arbitral decisions. 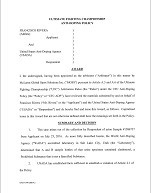 Because Rivera’s positive sample was collected after he was named to the fight card for UFC 201, which was held in Atlanta, Georgia, on July 30, 2016, this matter also falls under the jurisdiction of the Georgia Athletic and Entertainment Commission. As such, the Georgia Athletic and Entertainment Commission Rivera may impose additional sanctions on Rivera, including fines or a period of ineligibility that is longer than the period set forth above.